Round World Media founder, Valerie Landau, creates educational games and innovative application. She started her game design career as a graduate student at Harvard Universitities Graduate School of Education. She went on to be an educational game designer at Theatrix Interactive and worked on several awarding-winning games. She was the lead designer for Word Heads and an educational game designer for Math Heads. She conducted research, developed concept documents, design documents, and participated in all aspects of production including: art, programming, animation, sound design, quality assurance, and marketing. She was an educational game consultant for the Learning Company and Mattel developing educational games for Barbie and microscopes for girls and for WGBH Interactive. Math Heads is a multi-prize-winning educational game focused on pre-algebra skills. The game takes place within U-TV a futuristic interactive game show television network. Players create an animated character and surf channels to appear as players on a variety of interactive game shows. Players score points on their credit card and buy math upgrades on the shopping channel. The game was developed based on objectives set out in the curriculum Standards of the National Council of Teachers of Mathematics. 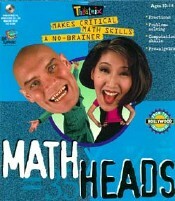 Math Heads is translated into Spanish and Swedish, and has won press accolades and prestigious awards. "The hippest program for kids 10 and up. MTV-style attitude..."
"Math Heads is hip, attention-grabbing and a fun way to learn math"
"The funkiest, greatest math program of the year!" "Engage your students and help them see math as something social and cool -- what more could you ask for?" "Beneath the high-speed, high-volume presentation...some serious mental math skills are being taught." Valerie Landau served as the lead game designer for the interactive CD-ROM game Word Heads for Theatrix Interactive. She wrote the design documents for the game. Channel surfing this virtual tube comes across lots of attitude and irreverent shenanigans—exactly what makes some kids lock in on the basic lessons in vocabulary, spelling and other language smarts. Like the ‘tude-added “Math Heads” that started the “Get A Head” software series, this wordy sequel lampoons TV shows. One or two kids create their on-screen alter-egos who venture into games shows like “Go Figure,” a take-off on “Celebrity Squares” where the celebs try to stump players with their own meanings of figures of speech. More word play in “Meet Your Match” pieces word parts in search of the defined term. In “UNews” you play with parts of speech to create your own wacky news stories. WGBH's Enhanced Arthur is benchmark digital prototype–demonstrating the excitement and potential of what a digital television may look like in the future. Enhanced Arthur is a prototype developed by the PBS TV station WGBH as part of a grant from the Corporation for Public Broadcasting. "Valerie Landau was instrumental in the initial design phase of the project and conducted formative evaluation with groups of kids ages 5-10. Valerie is innovative in her approach to education, technology and television"
Valerie Landau served as an Instructional Designer for creating concepts for Mattel's educational Barbie software initiative, 2000-2001. Valerie Landau conducted research on children's game play for The Learning Company, 2000-2001. Valerie Landau created an educational game book and teachers guide for the children's musical story The Chicken Made of Rags. 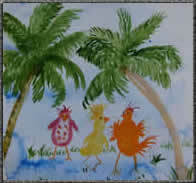 The Chicken Chicken Made of Rags is a multicultural children's musical story with Holly Near and Soul Vibrations. The Chicken Made of Rags written by Nina Serrano, Produced by Greg Landau, Redwood Records, 1993.